As Autumn gets into full swing, the leaves fall and wet weather typically follows. Speaking from personal experience, I own three dogs, two of which hate the wet weather and virtually refuse to go outside. One however, the youngest, loves it. In fact, if he could sit outside all day and catch the rain he would. This month we have found four products we think you and your dog will love. Practical, yet stylish and as Christmas fast approaches, well, thoughts turn to treating our loved ones don't they. As your adventures become colder and wetter, protect your dog with the waterproof Ruffwear Aira Rain Jacket. With a lead portal making it easy to loop your dog’s lead through if wearing a harness underneath, this lightweight jacket is designed to be easy to slip on and comfortable to wear. The oversized collar gives extra protection from the weather and with its reflective trim, it’s the perfect jacket for Autumn and Winter. There is even a light loop, so you can attach a safety light. We all know muddy paws are inevitable during the wetter months, but with these personalised dog towels you can have some fun while being practical. Embroidered in the UK on 100% cotton towels for maximum absorbency, they are available in a huge range of designs and colour choices. Choose from three sizes to suit your dog’s breed and size. Take advantage of a 10% discount until 30th October using discount code ‘K9’ at checkout. Made with 100% natural human grade quality meat, Pet Munchies Training Treats are available in Chicken, Sushi and Liver & Chicken. Mouth watering and naturally low in fat, the Chicken and Liver & Chicken flavours are also wheat, soya and gluten free. Loved by dogs in the show ring and Agility Team GB, these bite size, softer treats are suitable for puppies to older dogs. Perfectly formed in a pocket-sized bag, they’re ideal for dog walks. 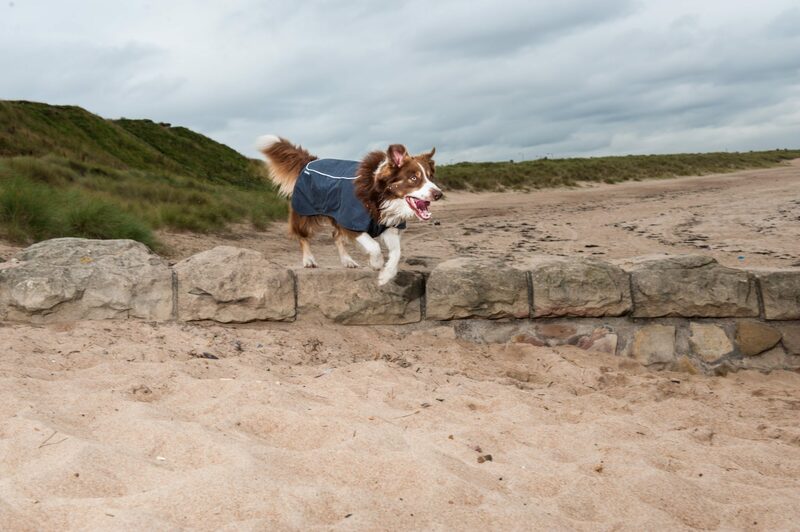 Proudly manufactured in Britain, Dogrobes are practical dog drying coats that are perfect to use after outdoor adventures, swimming, training, bathing and working. They work by absorbing moisture from a dog’s coat and trapping their body heat, drying the dog quickly while keeping their muscles warm. Why does this happen? The secret is the longer loops on the inside of every Dogrobe, specially designed to optimise drying time to approximately 30 minutes. Could your home do with a little extra help this season to combat dirty paws? Our latest competition to win a bundle of cleaning goodies from BISSELL might be right up your street. Take a look on www.freepetstuff.co.uk where you can enter for your chance to win.